BRADENTON Every 10 minutes, a bird calls out from the roof of the new courthouse. It could be a red-tailed hawk or another bird of prey. Other times it is the call of a pigeon in distress. The calls can be heard blocks away — the high-pitched hee-hee-hee, the whistling. But leave the binoculars in the car and the field notebooks closed. The calls are real-life recordings that carry across downtown from two speakers, one facing east and the other west. They are supposed to minimize the presence of roosting pigeons, whose droppings have become a problem on the roof of the nine-story judicial center. "Pigeons," says the building manager, Phillip Hoffmann, "were not a priority." In looking for ways to solve the pigeon problem, county officials settled on a simple method from a California company called Bird-B-Gone. Bird-B-Gone makes a product called "Bird Chase Super Sonic," which resembles a portable radio with knobs and buttons. The device, which plugs into a standard outlet, comes with two speakers designed to carry the frequency of bird calls. There are several settings, depending on the bird that is the nuisance. Among them: woodpeckers, starlings, crows and sea gulls. Every 10 minutes, the system kicks on and runs for about two minutes. You can set it for day or night, or both. "Bird Chase Super Sonic" runs about $225. The last thing a pigeon wants to hear are the calls of predators such as hawks and falcons, says Bird-B-Gone owner Bruce Donoho. Additionally, a pigeon distress call, he says, is a sure way to keep pigeons out of a particular area. There is a whole market out there for people who want to use nonlethal measures to try to deter pesky birds. One device emits ultrasonic sounds waves, using frequencies humans cannot hear. But that system works best in enclosed or semi-enclosed areas. 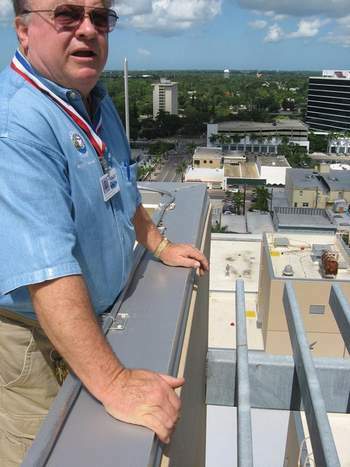 A fake owl — such as the one atop the historic courthouse in Bradenton — works until the birds get hip to the fact that the predator is not a genuine threat. And then there are nets and sets of plastic or metal spikes that deter birds from landing in an area. One product shocks birds when they land. Donoho says the county may not be interested in that product, for fear of public criticism. "They may be sensitive to shocking birds, but it’s an excellent system," Donoho said. The next time you are near the judicial center, you might hear a hawk, but you will not see the bird.